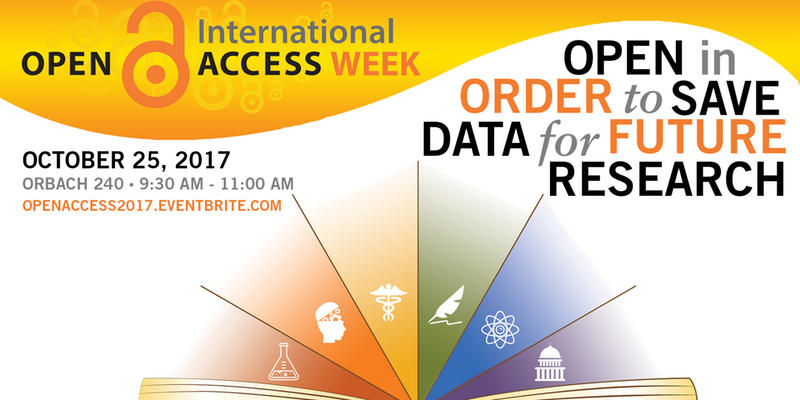 • International Open Access Week, Wednesday 25 October 2017, 9:30–11:00 a.m., University of California, Riverside, Orbach Science Library, Room 240. “Open in Order to Save Data for Future Research” is the 2017 event theme. Open Access Week is an opportunity for the academic and research community to learn about the potential benefits of sharing what they’ve learned with colleagues, and to help inspire wider participation in helping to make “open access” a new norm in scholarship, research and data planning and preservation. The Open Access movement is made of up advocates (librarians, publishers, university repositories, etc.) who promote the free, immediate, and online publication of research. The program will provide information on issues related to saving open data, including climate change and scientific data. The panelists also will describe open access projects in which they have participated to save climate data and to preserve end-of-term presidential data, information likely to be and utilized by the university community for research and scholarship. • Brianna Marshall, Director of Research Services, UCR Library: Brianna welcomes guests and introduces panelists. • John Baez, Professor of Mathematics, UCR: John will describe his activities to save US government climate data through his collaborative effort, the Azimuth Climate Data Backup Project. All of the saved data is now open access for everyone to utilize for research and scholarship. • Perry Willett, Digital Preservation Projects Manager, California Digital Library: Perry will discuss the open data initiatives in which CDL participates, including the end-of-term presidential web archiving that is done in partnership with the Library of Congress, Internet Archive and University of North Texas. • Kat Koziar, Data Librarian, UCR Library: Kat will give an overview of DASH, the UC system data repository, and provide suggestions for researchers interested in making their data open. This will be the eighth International Open Access Week program hosted by the UCR Library.